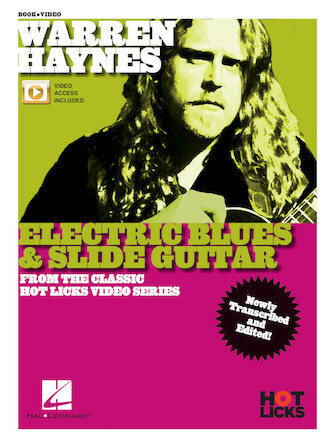 The legendary Hot Licks guitar instruction video series is being made available in book format with online access to all the classic video footage. In this edition, guitarist Warren Haynes (Gov't Mule, Allman Brothers Band) covers a wide range of blues-rock and slide guitar skills and techniques, including phrasing, vibrato, string bending, and soloing as well as mixing major and minor scales, using space, and exploiting those blue notes within intervals. You'll learn: attack and vibrato; string bending technique; playing outside the blues scale; fingerpicking slide guitar; damping techniques; slide vibrato and intonation; and more.